One of the reasons Boston-area companies choose Berkshire Natural to provide heathy snack and fresh fruit delivery is because we curate an awesome employee experience. We’re always on the hunt for new and exciting products to bring into the mix. 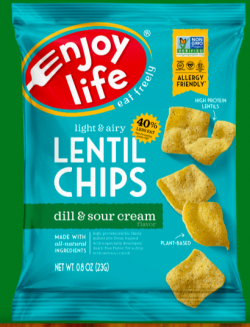 A great example is Enjoy Life Dill and Sour Cream Lentil Chips. One of Berkshire Natural’s co-founders discovered these at a food show in Manhattan last summer and knew our clients would love them. They’re incredibly tasty but also healthy, with 40 % less fat than regular potato chips only 110 calories per bag. At Berkshire Natural we strive to offer great products to folks with dietary restrictions and these chips fit the bill. They are non-GMO, vegan, and free of gluten, wheat, dairy, and soy. At Berkshire Natural, our key goals are to make employees happy and the jobs of the people we work with easy. We accomplish the latter by offering suggestions of new products to try and by stocking company kitchens. And if you work with us, you deal directly with an owner of the company — we are always just a phone call or text away. If you want to learn more about all the delicious products we offer as part of our healthy snack delivery service for Boston- area companies, just click here.